[Jesus said,] "What blessings await you when people hate you and exclude you and mock you and curse you as evil because you follow the Son of Man. When that happens, be happy! Yes, leap for joy! For a great reward awaits you in heaven. And remember, their ancestors treated the ancient prophets that same way." The New Testament writers operated under the recognition that Christianity would always be a rejected counter-culture. The values of the Kingdom are not the values of the majority of people. The demands of the King are thought to be silly, harsh, or judgmental by those outside the Kingdom of God. Because many of us live in a watered down, pseudo-Christian culture, we are sometimes surprised when Christians are ridiculed, ostracized, and persecuted. Yet a night or two of television, a day or two watching hearings on possible judge appointees, and even a casual conversation overheard at the office water cooler reveal that Christians who truly seek to follow Jesus are frequently the objects of disdain. 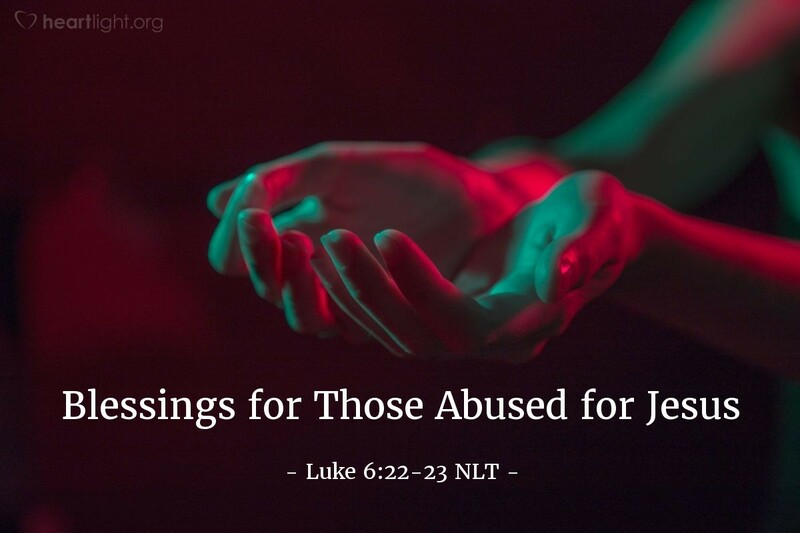 Let's make sure that if we suffer for the name of Christ, it is because we have been people of character and respect, not because we have been obnoxious or self-righteous. At the same time, let's also remember that suffering for the name of Jesus is part of being a Christian. Rather than being surprised, let's view these troubles as opportunities to show the character and grace of our Lord! When we do, we can be sure of God's blessing! O LORD, God Almighty, help me to be a person who brings your blessings to others. May that be true in my casual encounters with others during the day. May it be true of those with whom I share my faith. May it also be true when I find myself under attack for my faith. May my life always reflect the generous grace and the committed character of my Savior, Jesus, in whose name I pray. Amen.